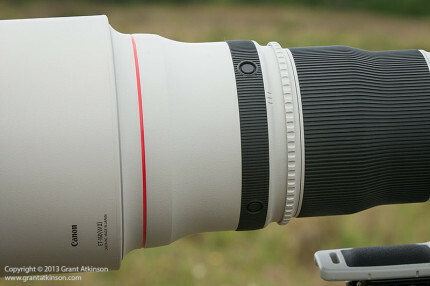 When Canon announced the replacement of all 4 of their super telephoto lenses a while ago, I remember wondering exactly what sort of real upgrades the new lenses would offer. It turned out that I was most impressed by the first two lenses that I reviewed, which were the EF 300 f2.8 L IS ii and the EF 400 f2.8 L IS ii. When the 600f4 ii arrived, I already had some idea of what to expect, based on what I had experienced with the other two version ii lenses. The EF 600 L f4 IS ii replaces the earlier version 600 that had been on the market since 1999. At that time digital camera technology was still in its early stages and there has been marked progress in cameras bodies in the interim. The EF 600 f4 L IS ii, along with the other 3 super telephoto lenses, incorporates advanced technologies in its design and specification, and the result is a lens that is much improved overall, and significantly so in certain aspects. Although the new 600 may resemble the older version at a casual glance, once you take a proper look at it you realize that it is a completely new design that shares little with its predecessor apart from broad specifications. There is less of the new lens than the older one, even though it costs more. The 600ii is 8mm shorter than its predecessor, but much more importantly, is 1440g lighter. That is a whole lot of weight, and is perhaps the most significant improvement of all. The lens mount is standard Canon EOS, complete with the weather-sealing rubber ring. The base of the lens is deeply textured, to help grip it when taking the camera body off or on. The single large switch panel that was found on the side of the lens barrel has been divided into two smaller panels. The first panel is mounted close to the base of the lens, where it can be easily reached by the photographers left hand and houses the switches controlling AF/MF and also the distance limit selector. All the new panels and switches contour more closely to the shape of the lens barrel. The switches are recessed and also require slightly firmer pressure to move them. As a result of these changes, it is now much more difficult to accidentally bump a switch and reset it. This is something that happened quite often to some users of the old lens. A drop-in filter holder that is standard 52mm Canon is standard with the lens, and is the same as on all of the big white teles for some years now. I cannot recall ever seeing somebody using any kind of filter in the field on the long lenses, and I for one would be quite happy to see the drop-in filters disappear, in the interests of better sealing and simplification. I am sure there must still be some folk who need them though. 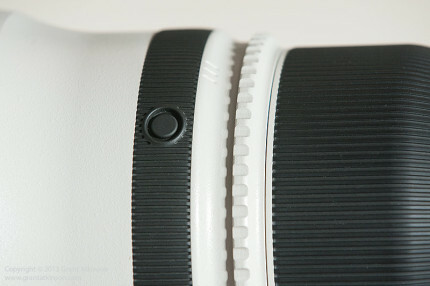 The tripod collar is still an integral part of the lens and cannot be removed, and the locking knob now has a cover that can be opened to reveal a slot for a lock. It is positioned high on the lens barrel, where it is easy to reach without having to lower your hand from the lens barrel. The tripod foot itself can be unbolted from the tripod ring. The foot looks to be identical to the old foot although I did not test that. If it is so, that is good as this means that upgraders who already have lens plates for mounting to their own support system will be able to just move their old plates over from the old lens to the new. Smart thinking by Canon if this is the case. Ahead of the tripod ring is the focus distance scale and below that is the second switch panel, which is home to the switches controlling Canon’s latest iteration of their image stabilization system. More switches control the focus preset feature beneath that. 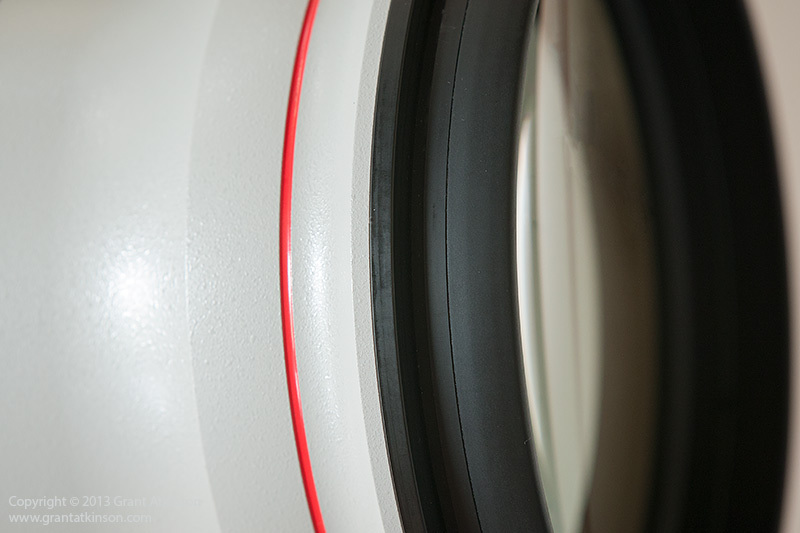 The focus ring is a whole lot wider on the new lens. This makes it easier to grip and turn, even with gloves on. Whilst I like how easy it is to access the new big focus ring, I have found that these oversized focus rings can easily get inadvertently shifted when holding the lens, or when shooting it from a beanbag. 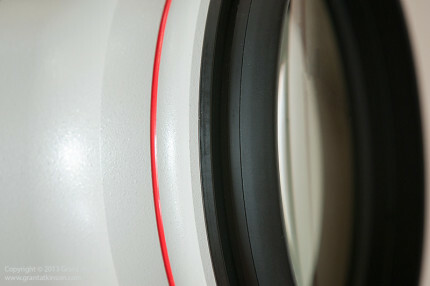 The really big focus rings may be most suited to users taking videos as opposed to stills photographers. Ahead of the focus ring is the knurled collar that activates the Focus Preset when utilized. In front of that are four rubber-covered buttons on the front collar of the lens, that can be programmed to perform various functions, depending on which camera body you use. The collar where the lens hood mounts, at the end of the lens, has changed colour, from white to black, which is progressive in that the new black colour will no longer show scuff marks that were left behind where the lens hood locking knob tightens down. The lens hood is identical to the old one in size, but the locking knob on the new lens has been redesigned and doesn’t protrude as much as before. This makes it less likely to snag on the sides of camera bags, bean bags and clothing. The new hood has been further improved by it’s redesign and the complete omission of the tiny mounting screws that were found at the base of the old lens hood. Those screws were very annoying in that they used to regularly come loose and fall out of my own Canon 300 f2.8 hood. The hood attaches firmly with the locking knob and provides lots of protection for the front element. There is a nylon cover that locks down with a velcro tab to provide protection for the front element once it is attached to the end of the hood. Changes are not restricted to the outside of the lens only Big news inside the redesigned lens is that the new lens has two flourite elements instead of just one in the old version. Flourite is highly effective at combating chromatic aberrations as well as flaring and ghosting. It also weighs less than some other optic materials and is one reason for the higher cost of this new lens. The new EF 600 f/4L IS ii has 16 elements in 12 groups, compared to the older lens which has 17 elements in 13 groups. There are now 9 aperture blades in the diaphragm, as compared to 8 in the old lens, which should result in smoother edges to the shape of the aperture circle. The lens is supplied with a very robust hard plastic case (600B) that is good to store the lens in and for transporting when you have the room for it. The new case is very well made, and has feet on two sides for standing. There are straps for the lens, two different lens foot attachments and a strap for the case itself all supplied within the large case which can be locked. 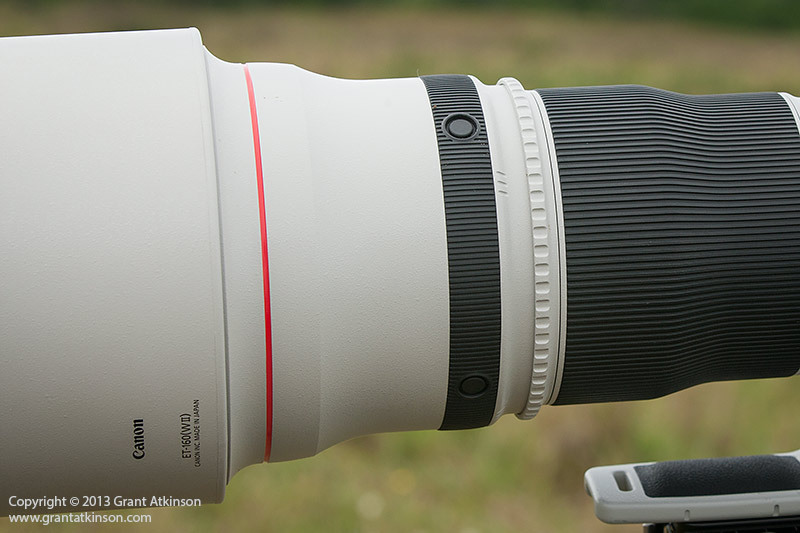 The weight difference between the new and old lenses is game-changing. Every single time that you pick up the lens whether to load it into a car, or carry it through an airport in a bag, or to reposition it for shooting, or to hold it up and mount it on a tripod, or when handholding it, you will notice the difference. I can comfortably handhold this lens, not for hours but certainly for continuous five minute periods with short rests in between. With the older Canon 600 I can only manage about a few seconds of handholding and even then I am never quite steady. 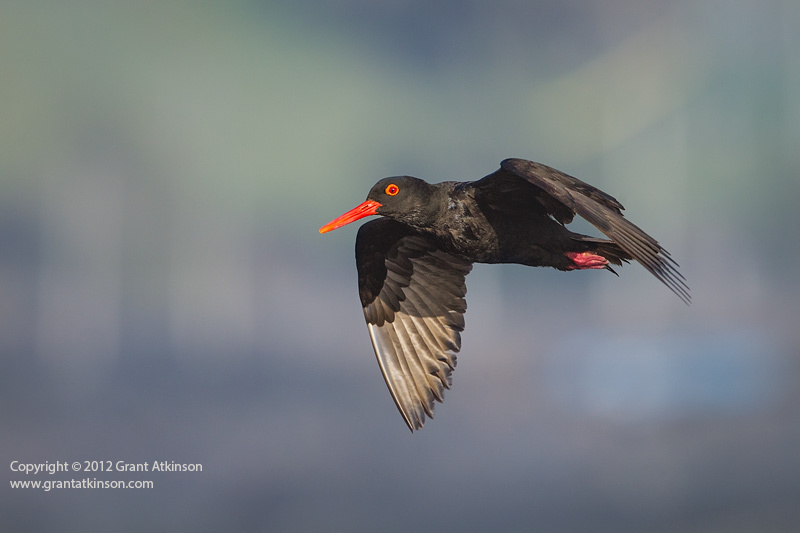 That is itself changes how the lens can be used, and for nature photographers who are always trying to get closer, lower, higher, in other words shooting from positions that are not always ideal, the new 600 f4 ii makes a massive difference. Not only is the lens 1.4kg lighter than its predecessor, but what weight there is has been redistributed somewhat, and it now has much less of a front-end heavy feel to it. Again, this enhances the hand-holding experience and means that it can be controlled that much better. It is obviously still a very bulky piece of gear, and it is still heavy. Using it inside a regular passenger vehicle takes some planning, and it easily takes up the whole passenger seat. Despite the bulk, it works well from a vehicle, especially if a bean bag or mount is used to allow the lens to be rested on or above the door. The new lens also works very well when used on a tripod, and even there, the lighter weight can be appreciated. The tripod collar rotates very smoothly and has four positive detents in its action, each one at 90 degree intervals in its rotation, to make it easy to keep the lens properly aligned, even without looking. Big and strong photographers will easily handhold it for long periods, but even diminutive shooters like myself benefitted from the newly-acquired ability to use the lens for fast action photography. There are times when shooting from a tripod can be very restrictive, and none more so when you have fast-flying birds that are flying toward or past you at varying distances and height. In such instances I was able to wait for my subjects with the lens balanced across my lap. Upon sighting an approaching bird, it was simple to stand and track the bird as it arced over, and I sometimes managed as many as 7 or 8 frames in such bursts, with the bird a good size in the frame. Handholding allows such flexibility, and it also allows instant reaction to sudden and unexpected subjects that may appear. Autofocus was excellent with this lens, and initial pick-up of moving subjects very manageable. Like all long lenses, it pays to try and keep the lens at least somewhat focused at the distance that subjects may appear at. That way, when you lift it up to begin searching for the subject with your AF point, you can usually see the subject quite clearly in the frame and AF acquisition is both faster and easier. 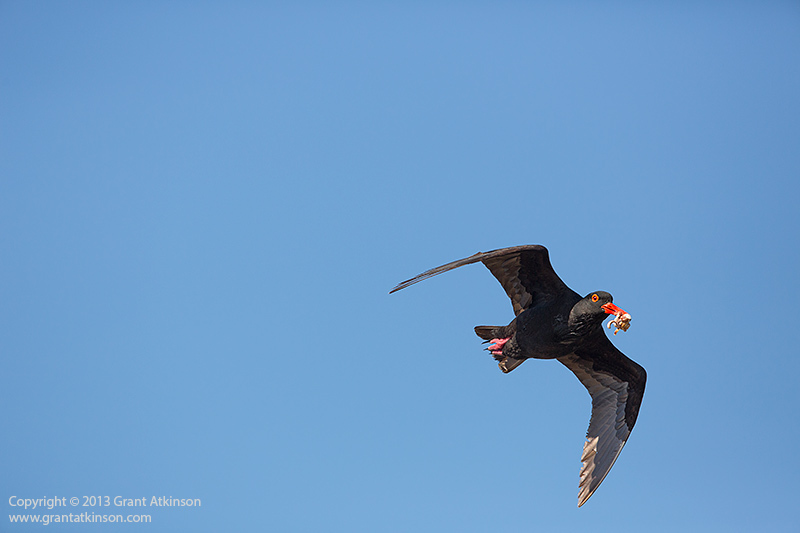 When shooting long lenses at subjects that might be approaching quite rapidly and without warning, it can be quite critical to pre-focus the lens. One way of doing this is to find an object that has high contrast and may be roughly at the distance and direction that I expect my subjects to come from, and focusing the lens on that subject. If you get very long lenses deeply out of focus, it can take so long to re-acquire that moving subjects may have passed you by in the meantime. 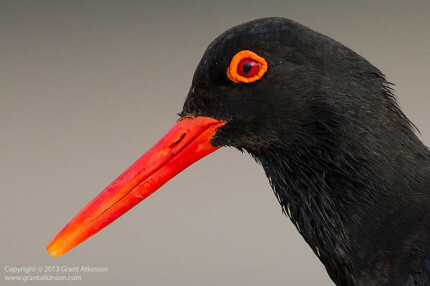 Some photographers are able to keep the lens close to being focused by turning the manual focus ring slowly until they begin to see the subject in the viewfinder, and then switching over to autofocus. I used the 600ii on three different Canon bodies, each with a different-sized sensor. 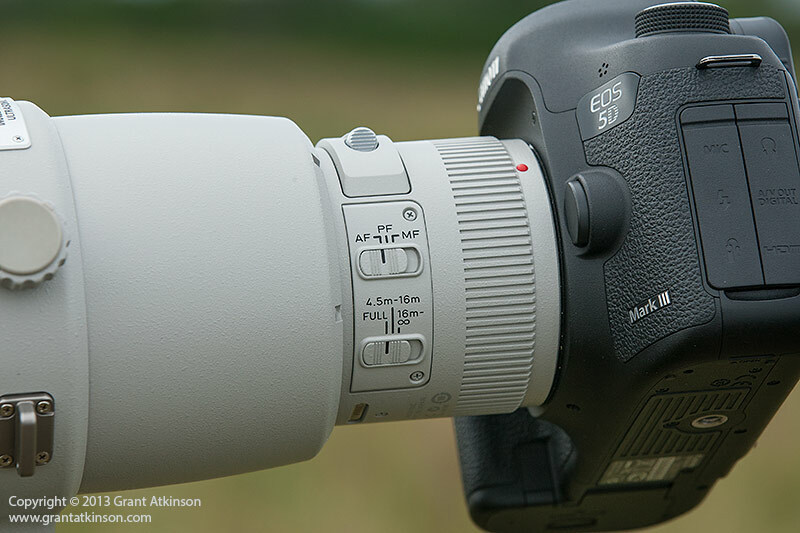 On the Canon 7D with it’s APS-C sized sensor, the field of view is roughly equivalent to 960mm. 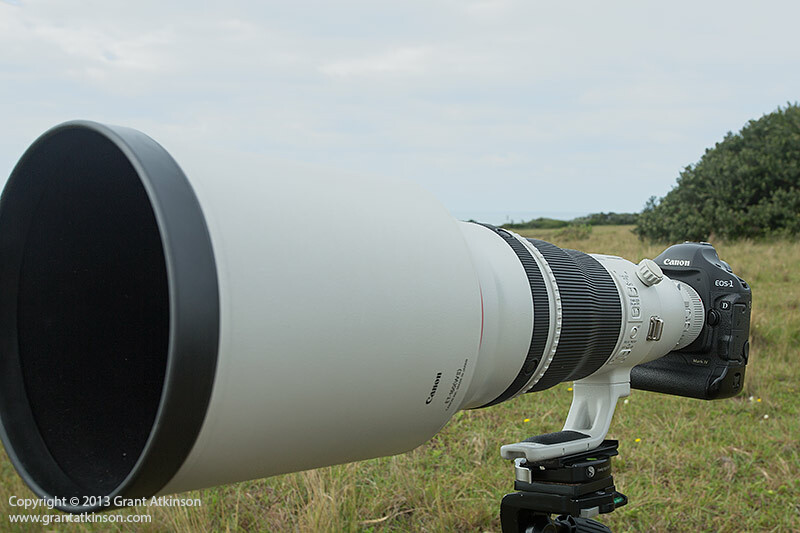 I found that combination the most difficult to use successfully for tracking speedy birds in flight, due to the narrower field of view, and the difficulty that gave me in finding the subject initially. However, when used with static subjects, or slower moving ones, AF was very good, fast and accurate. This proved to be a good combination for smaller subjects that were far away. 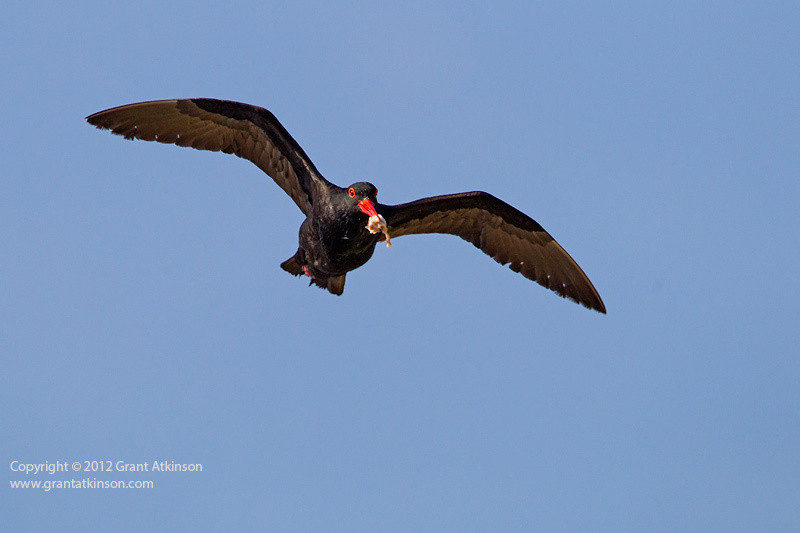 On the Canon 1Dmk4, which has an APS-H sensor in it, and a field of view equivalent to roughly 800mm, I had a lot of success with fast-flying birds. It is also probable that the more powerful battery in the 1Dmk4 drove the AF in the big 600ii faster than the other two cameras. On the 5Dmk3 and its full-frame sensor, I enjoyed lots of success too, with some of my best images coming from this combination during the test period. I found that I was able to make the AF less twitchy and more stable on the target by slowing down Ai Servo Tracking Sensitivy on all three cameras, with the slowest, stickiest setting working best for me when it came to keeping a fast-moving subject in focus. 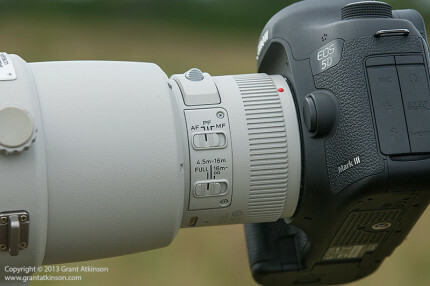 It is important to define what I expect from AF in a lens and camera combination in order to understand my evaluation. Any of these cameras will lock focus on this lens in the blink of an eye, when static subjects are targeted and the lens is shot from a mount. That is no real test at all for modern AF systems. Instead, virtually all of the shooting that I did involved handholding, rapidly moving subjects and sometimes my own location being a moving boat in a current of water! So extreme conditions for AF to succeed at and the results I got were rewarding. AF is as good as it gets and that should be expected from a lens of this level. Canon list revised AF computing, as well as new AF motors all being part of the new design. 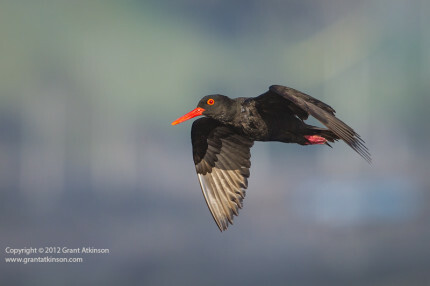 As can be seen from the accompanying images, when using the 600 f4 IS ii on both the Canon 5dmk3 and 1Dmk4, I was able to successfully track fast-flying birds, dark and light, against dark background, and in the sky, even approaching head on which is usually one of the most difficult challenges for AF. The distance limit switch has three settings. 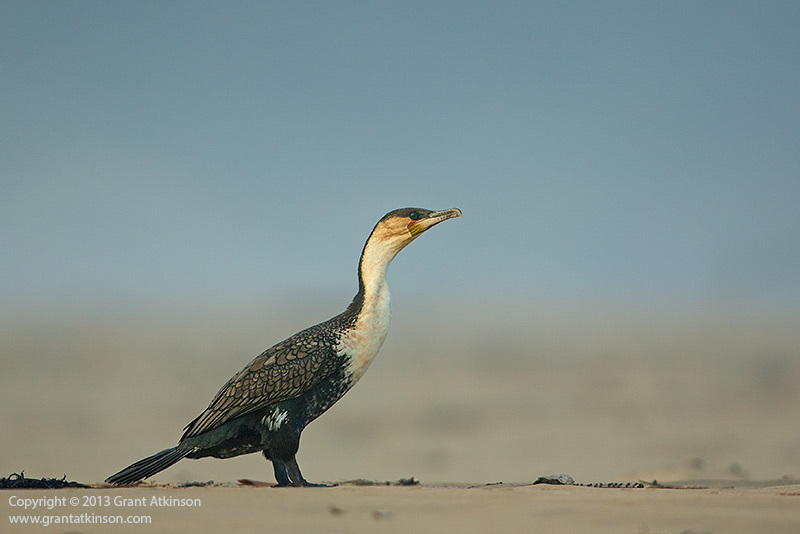 If you are photographing subjects at a distance that is not changing too much, setting the switch to suit your working distance can bring benefits to AF speed and reduce AF hunting. Always remember that switch and your last setting, as having it on an unsuitable setting can lead to confusion and disappointment. For most of the time, I prefer to keep mine set from the minimum focus distance to infinity. That way, should a subject suddenly come closer than expected, I can keep on focusing on it. The minimum focus distance on this lens has been improved, and it can now focus at 4.5m. This is a whole 1m closer than the old lens. This improvement makes a significant difference when shooting small subjects from close distances. As on most Canon super telephoto lenses, there are four rubber-covered buttons on the front collar of the lens, that can be programmed to perform various functions, depending upon which camera body is attached to the lens at the time. I keep mine set to the default, which is AF Stop, meaning that if you are shooting in Ai Servo focus mode, which I nearly always am, and you need to compose in such a way that none of your AF points will fall on your subject, then you can compose and push in one of these buttons in order to stop the lens from focusing whilst you hold in the button and recompose. A new feature activated by the same switch that selects between AF and MF, is PF or power focus. This is a new feature and it allows video shooters to make controlled focus pulls, driven by the electronic AF motor by using the front collar as a controller. The new 600 f4 ii is fitted with seals, gaskets and O-rings in virtually every place where moisture might gain entry. It means you can shoot the lens in light rain if need be. It also means that moisture won’t easily get inside the lens if you live in or use it in damp conditions. This is dependant upon the lens being matched to a suitably weather-sealed Canon dslr body though. Moisture sealing also means dust sealing, so dust will have a hard time getting inside this lens. 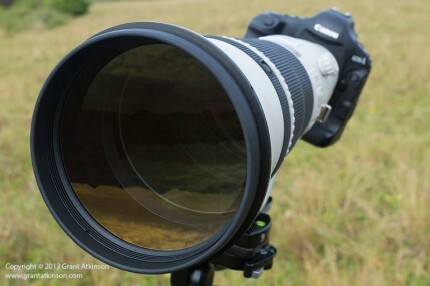 Canon claim that weather sealing is improved due to design advances with the new lens. The old 600 was very good in this regard, and this one should be at least that good, too. Both the front element and the rear element (the one closest to the camera sensor) are treated with a flourine coating, which makes it difficult for dust particles to adhere to the glass surface. These coatings also make it easier for users to get rid of smudges and fingerprints without leaving any residue behind. The IS system is very effective on the new lens. Most of the shooting that I did with the 600 f4 ii was handheld, and I used IS all the time. I had good results using Mode 1, and Mode 3. Mode 1 is for regular handheld shooting situations. Mode 2 is for panning, which you are most likely to do from a tripod or mount. Mode 3 is a new mode, and is specifically for photographing action. 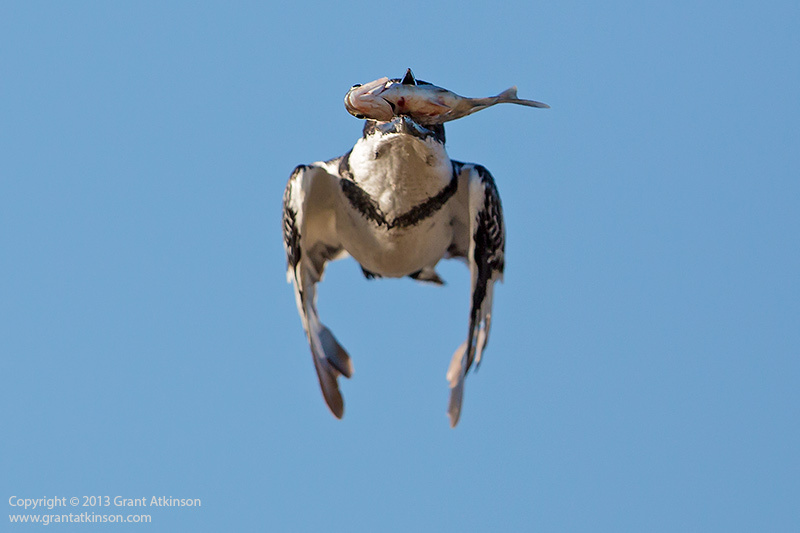 Wildlife and sports photographers stand to benefit most from it. In mode 3, the IS function is active but electronically locked. When the shutter is fully depressed, the camera releases the electronic lock and the IS responds to camera shake based on the running calculations. This means that the viewfinder is not stabilized during tracking, and one does not struggle with the image in the viewfinder jumping around due to the IS corrections. I did not get to shoot the lens for long enough in Mode 3 to be able to say that it was working better than Mode 1 for me or not, for handholding. 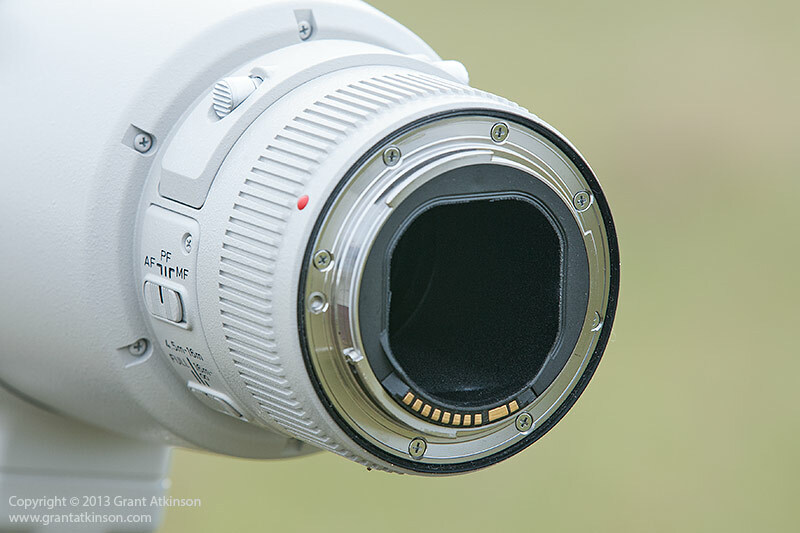 Canon claim that the IS system will detect when the lens is mounted on a tripod. They also claim that IS is still beneficial even when shooting from a tripod, in that there may still be slight camera shake or vibration to correct for. Many photographers prefer to turn IS off when they are shooting from a tripod, or when they are shooting at shutter speeds above 1/1000sec, and this is still an option. I generally prefer to keep the IS switched on at all times and have had no reason to change this. However, if one is shooting at very slow shutter speeds, perhaps a second or longer, then IS may be troublesome when tripod mounted, in Mode 1. The IS on the 600 f4 ii is noticeably quieter than on the older lenses, and it activates quickly and with a low click sound. The controls for the focus preset function are located just beneath those for the IS system. With this feature one can preset a focus distance into the lens memory and then recall that focus distance instantly at any time just by turning the collar on the front of the lens. I did not test the 600 f4 ii with extenders. One reason was that I only had a 1.4x ii extender on hand during the test period. I was also handholding the lens much of the time, and shooting fast-moving subjects, and the converter would have made both of those things a little harder for me to get right. There are many photographers using both the EF 1.4 III and the EF 2.0 III with great success on all four of the big Canon super telephoto lenses. My own preference is to work without extenders whenever possible but many photographers use them all the time with excellent results. I was not able to directly compare images taken with this lens and the old 600 side by side. Instead, I used the new 600 f4 ii in a variety of conditions and light. Image quality is about as good as it gets. The 600 f4 ii feels as if it produces image quality of the highest level. If it is sharper than the Canon EF 300f2.8 which is my own standard of reference, I am hard pressed to tell, on the screen that I use for editing. For me, image quality was not something that I worried about whilst using the lens. If I focused properly, and composed well, the lens more than does its part. What this lens does with backgrounds has to be experienced to be believed, especially if you are coming to it from a shorter focal length. Far-off backgrounds are rendered as dream-like blurs, and add so much to the impact of an image. The image below this text serves as an illustration. The background in this instance was a row of distant forested dunes. I was photographing from a moving boat, and shot with an open aperture for creative effect. I was most pleased with the outcome. What light fall-off there was on the edges of the frame was not so much that it would be significant to a wildlife photographer like myself. The 600 f4 ii outperformed the very good Canon EF 800 F5.6 L f5.6 IS in this regard. The image following this text is included to illustrate what little light fall-off there is at an aperture of f5.6 with clear blue sky for background. I found no evidence of excessive chromatic aberration, even when shooting in very harsh light and with strong contrast in the scene. Fine details were well captured, even with dark subjects, and in low light conditions. I did not shoot the lens into the sun to test for flare, but given that both the new 300 f2.8 IS ii and the 400 f2.8 IS ii are much improved from their predecessors in this regard, I would believe that the same is true of the new 600f4 IS ii. Flare happens when stray light gets reflected off surfaces inside the lens and either shows up in the image as small, circular, bright patches or even sometimes as large areas of low contrast. If you are a Canon shooter and you need the most focal length you can get, then you might also like the Canon EF800 Lf5.6 L IS lens. It is very sharp, has the most focal length of any ‘over the counter’ Canon lens and is an impressive beast to work with. However, it is significantly heavier than the 600f4 IS ii, and is also one stop slower, which means it does not autofocus quite so rapidly. Another advantage that comes with choosing the 600 f4 IS ii is the fact that you can add a 1.4x extender to it, to get 840mm f5.6 for extra reach, or even the 2x extender, though you will need a 1D-series body for autofocus to function in that configuration. The big price increase that this lens has shown also means that used 600 f4 L IS (version 1) will remain the only option for some shooters. The increased weight is the single biggest disadvantage that the older lens has in comparison with the new model. Other options are the Canon EF 500 f4 L IS ii, which is lighter yet again and smaller than either of the two 600mm lenses. The new 500 has a feature set almost identical to the new 600, and it can easily be combined with extenders again, to increase reach. 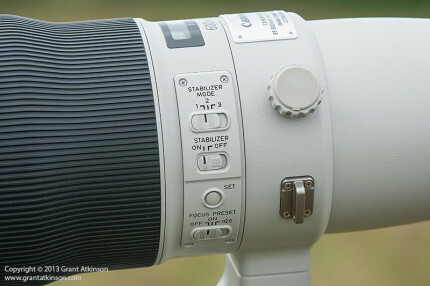 Still more options are the Canon EF 300 f2.8 L IS ii and Canon EF 400 f2.8 L IS ii super telephoto lenses, particularly when combined with 1.4x and 2x extenders. The 3oo plus extenders is a lot less costly, but gives up a full stop at 600mm and a max aperture of f5.6. 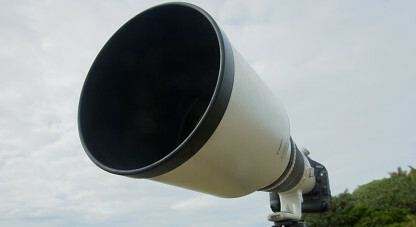 The 400 plus 1.4x extender is also very costly, but this combination results in a 560mm f4 lens, which is not too far off the 600 f4 in terms of focal length. With the older, version 1 lenses, many photographers chose the 500 f4 over the old 600 f4 due to weight. Well, with the weight loss and redesign, the new 600mm is likely to become the new 500mm in terms of who buys it and how it is used. The Canon EF 600 f4 L IS ii is a highly refined piece of equipment that is very exciting to use and produces outstanding images. 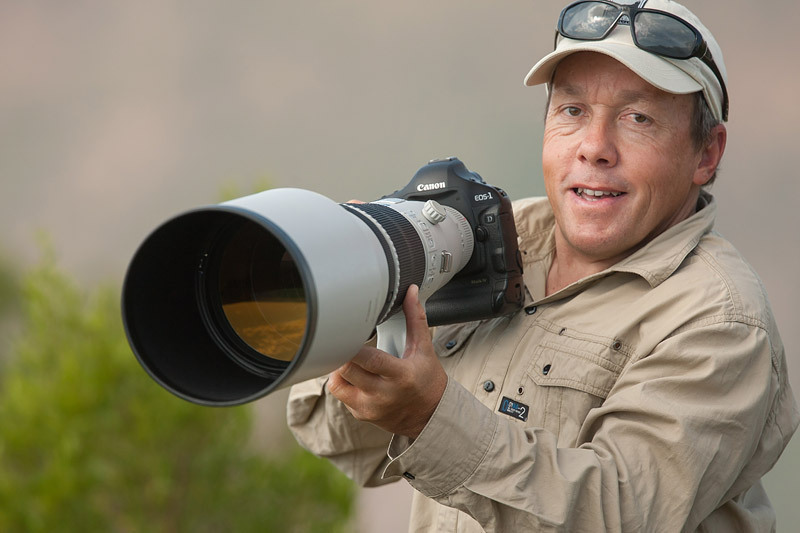 Without any doubt, the suite of improvements and enhancements that Canon has made to it, combined with the weight loss, mean that I consider this the best 600 mm telephoto lens available and a benchmark product in photography at the time of writing. Great read. Loved the photo with the bird (Pied KingFisher) and big fish in its mouth. Glad you enjoyed the review, Nqina! 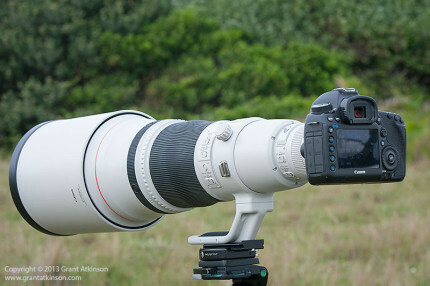 I have seen many of your pics on ODP…you do good work with that 500f4 and the 1D body! And thanks for the feedback on the field reviews. I may never use such a lens but reading any of your reviews clarifies many questions I didn’t even know I had until I read the answers… 🙂 Enjoyed the demonstration photos as well. I would love to be able to photograph birds better. Excellent contribution! 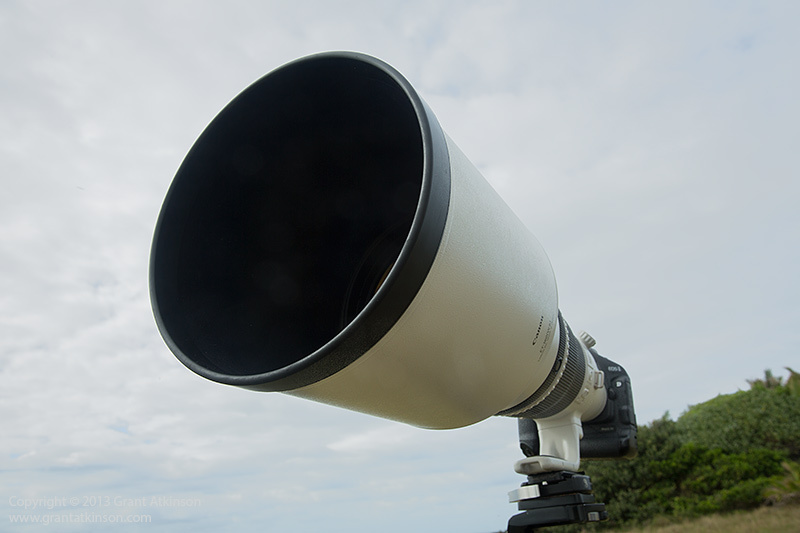 I would like to give only an additional, short hint, which is valid for all 4 super telelenses version II from Canon (300, 400, 500, 600 mm). Since Aug. 2012 there is a new firmware 1.1.1 for these 4 lenses produced before that month. You can find more informations on the support website (for example canon.de/support) and which lenses are concerned (serial numbers). You can´t realize this update at home, you have to send your lens to a Canon Sevice. Hope it helps! Regards to Helena and you! Most useful information and remiss of me to have left it out. As the lenses tend to arrive in South Africa a little later than in some other parts of the world, most should have the newest firmware. Thanks again for the information. Thank you Grant for the good review given. Great Lens, I bought it about 10 months back and for me Photography hasn’t been the same, Yes you have rightly said, as with long lenses you have to prefocus it or else by the time it focuses on birds in flight, you miss the shots, I love the lens for its pictures giving shallow depth of field, and I feel that at f6-8 its the best, getting the birds eye and shoulders pretty much in focus. I have uploaded some pictures on my flikr account – arvindflikr. Now i’m sure that i did good choice. I will get it in the end of this month.